The ‘official first episode’ of season seven is with none other than Armin Vit of Under Consideration. First off, big thanks to the American Advertising Federation of Omaha, who brought Armin into town to keynote their great yearly student event – Meet the Pros. And bigger thanks to them for letting us bring him to our office to chat on The Reflex Blue Show. Last time we had Armin on for a whole show, he had just announced closing down Speak Up, but this has not slowed down the activity of Under Consideration. It may have caused the opposite. On this episode we talk about the newest Under Consideration venture – an Austin speaker series called the Austin Initiative for Graphic Awesomeness – and the mascot the Baticon (shown above, and designed by Brandiose). We also speak about Brand New, and Armin’s thought on the myth of inspiration. 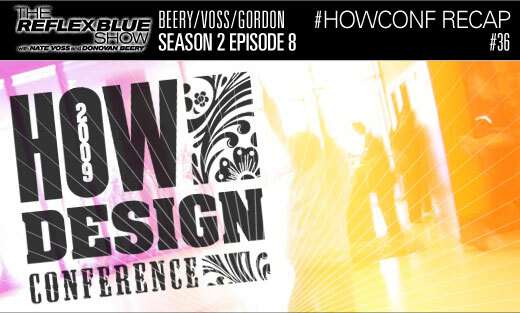 Today we welcome Steve Gordon as our guest to do a complete recap of our experiences from the HOW Conference. We also spend some time discussing Graphic Design, Referenced by Armin Vit and Bryony Gomez Palacio, and how it may be the best graphic design textbook released since Meggs’, and possibly even better. And of course, we discuss the office decoration we just got. Things will never be the same around here again. Download The Reflex Blue Show with Nate Voss and Donovan Beery, Season 2 Episode 8 (36 meg) or click here to subscribe to The Reflex Blue Show from the iTunes Music Store. Doing it right from Austin, Texas, live from the Conference Center’s 4th Floor — The Reflex Blue Show HOW Conference Special continues! Day One guests include speakers/authors Jen & Ken Visocky O’Grady, author/speaker/man-about-town Steve Gordon, and Not-Anymore-Speaker/Not-Quite-Author Justin Ahrens (who graces us with a full-show appearance)! It’s all about setting the tone for the conference and covering the pre-conference workshops (sort of), and the lead-up to the conference itself — as it appears on Twitter? Also featuring the mad psyching-out of the O’Gradys vis a vis Armin Vit’s Design History & Practice: Mano a Mano battle royale that is apparently going down like Chinatown Thursday night. Download The Reflex Blue Show HOW Conference Special: DAY ONE (17meg) or click here to subscribe to The Reflex Blue Show from the iTunes Music Store.